I love colors and I love incorporating them into my everyday style. I've never been an all-black all the time type of girl even though my closet might say different. 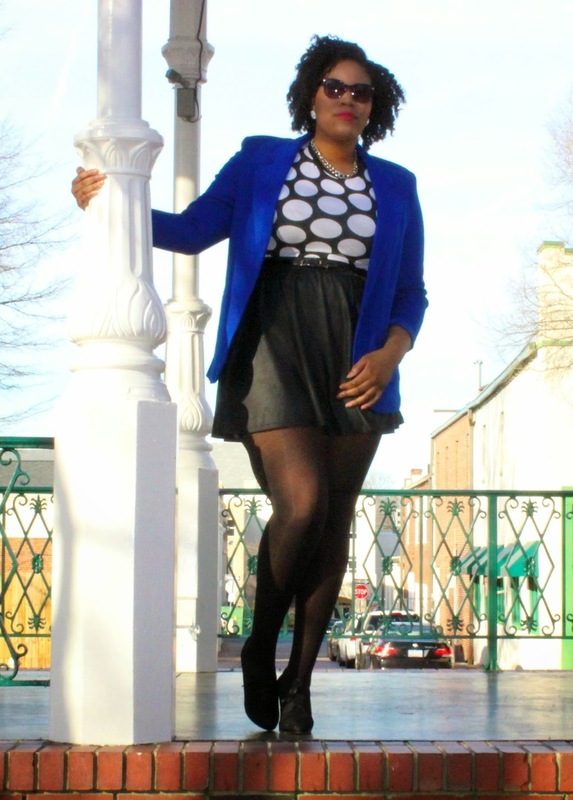 Recently my aunt saw a photo of a young lady wearing a cobalt blue color she said she thought that color would look good on me and I immediately remembered that I had a cobalt blue blazer just dying to be pulled out and dusted off. My Aunt Dee, who is the one the suggested the blue hue, is one of my favorite aunts (I love them all the same though) but we have a really close relationship probably because when I was in college she feed me every weekend and let me wash clothes at her house which is true love. I remember when I was in 3rd or 4th grade I had to write a paper about somebody that I admired and as much as I love my momma I decided to write the paper on my Aunt Dee and that’s when I know that she was one of my favorites. I love my family and love when they give me encouragement and ideas for my blog. It makes me really happy inside to know they believe in my dream and actually take the time to read my blog so I try to make sure that I work their suggestions into a post. I decided to go for the classic black and white with a pop of color statement. This is one of my favorite color combinations. I paired a black and white polka dot tee shirt with a simple black skater skirt. 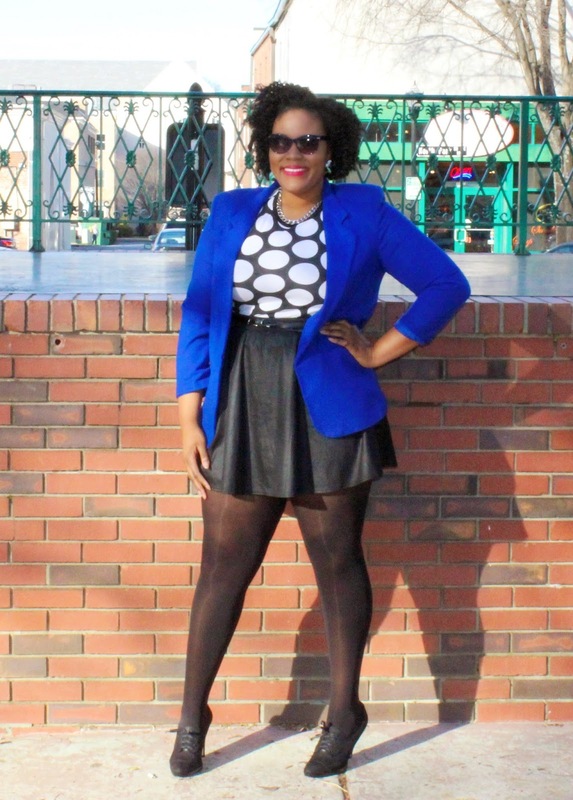 I choose my black oxford heels to bring a preppy classic look and layered the outfit with the cobalt blue blazer. I wore a black skinny belt for a more defined waist, silver jewelry and of course I had to throw on a pair of tights for this frigid crazy weather. No matter what I will also make sure to have a little color in my closest to brighten my wardrobe. What hue look good on you? Yassssss honey! I love it! There are so many things I'm loving about your outfit. 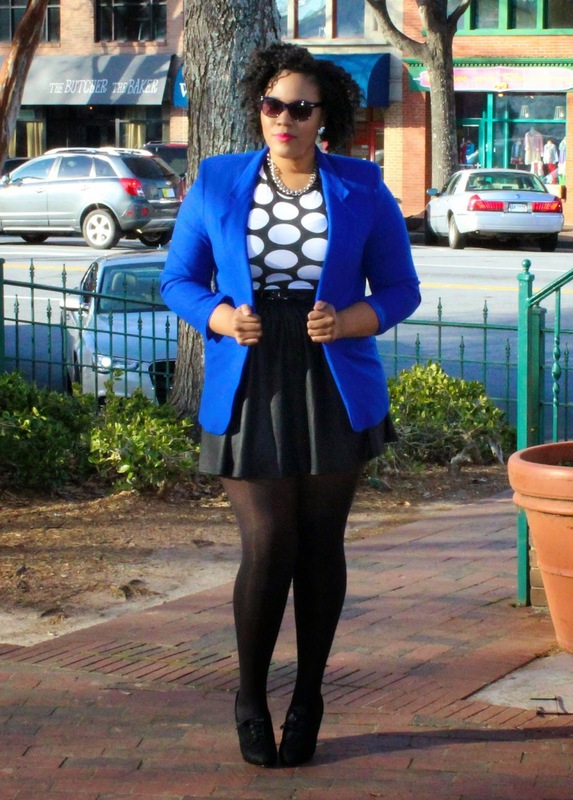 The fit, the pop of color, the polka dots shirt, the black tights, and the cute little skirt! Fabulous! Always love the pop of color with black and white! That blue is everything! I love this look! 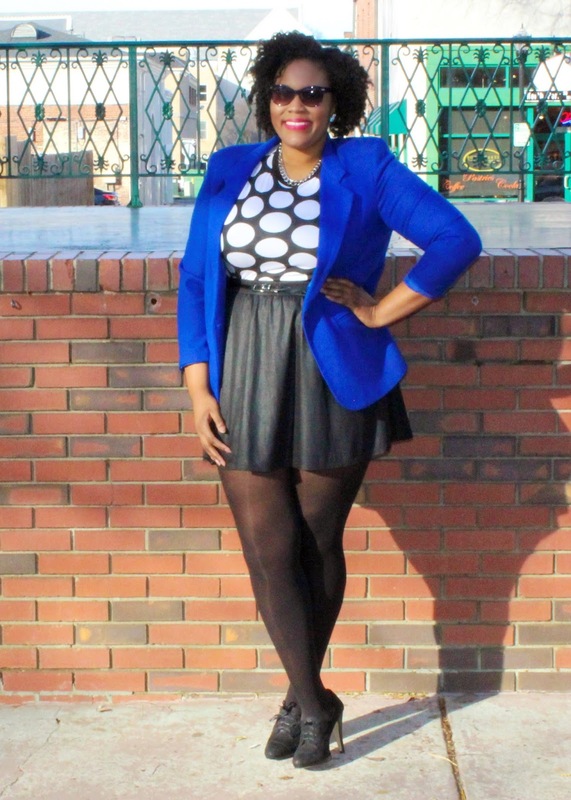 The cobalt blue blazer is so beautiful and vibrant. I can't believe you found it at a thrift store…awesome! The thrift store is my spot!! Thanks for reading!